The Corporate & Community Site Index rose further into positive territory this week led by a 13% gain at TheDryDown. 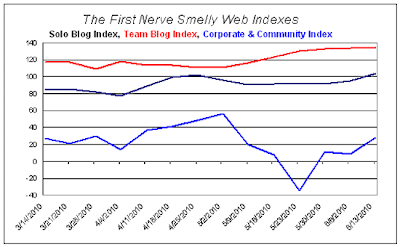 Sites on the Team Blog Index had small gains with the exception of PerfumeDaRosaNegra which slipped 5%. The Solo Blog Index posted a nice nine point advance with big gains at IndiePerfumes and JaimeLeParfum. One thing has struck me in compiling the Smelly Web Indexes each week—some sites show little variation in Alexa rank, while others tend to yo-yo up and down. I decided to look into this more closely and commanded the Stat Monkeys to compile a coefficient of variation (COV) for all our listed sites. Hunh, you say? Math heads can find the full explanation in the fine print below; for everyone else, all you need to know is the bigger the COV, the more variable a site’s rankings. Right off the bat we find that Team Blogs, with an average COV of 0.14, have far steadier rankings than Solo Blogs (0.26) or Corporate & Community Blogs (0.27). At the other end of the scale are FirstNerve and OlfactaRama. Their high COVs reflect large variability, due not so much to week-by-week fluctuations but to long-term rises and sudden drops in Alexa ranking. 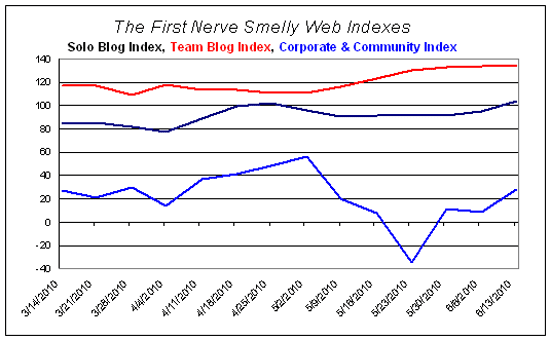 By comparison, the COVs of Team Blogs range from a tiny 0.06 at NSTPerfume to 0.20 at ISmellThereforeIAm. Among Corporate & Community sites, the steadiest is BaseNotes (0.08) and the most variable is TheDryDown (0.46). [The Fine Print: For each site we calculate the average Alexa traffic rank across the past 45 weeks. Next we calculate the standard deviation; this is a measure of variation around the average. (Two sites could have an average rank of 5, but the weekly data for one site look like this (5, 4, 5, 6, 5, 5) and the other look like this (3, 2, 7, 5, 8, 5). Clearly, the first site has steadier rankings that the second. The standard deviation reflects this: for the first the standard deviation is 0.6; for the second it is 2.3. Thanks. You just made my brain hurt. Dude, you should be relieved. Your COV score of 0.15 means your traffic rankings are waaaay more consistent than the rest of us. Like I've said before: your blog flies at such a high altitude it totally avoids the bumpy weather the rest of us contend with. Sensory psychologist specializing in olfaction. Independent scientific consultant at Synesthetics, Inc. Creator of Nick Zollicker. Author of What the Nose Knows. Hurry, Katie, Before it Wilts!